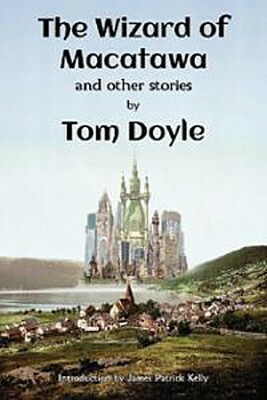 This story is featured in Tom’s collection, The Wizard of Macatawa. (Take a look at the original artwork for this story, provided by the wonderful Fiona Meng. 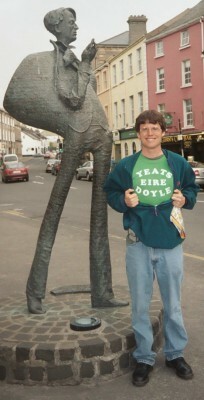 In June 2004, I flew to Ireland for the hundredth anniversary of Bloomsday, the day immortalized in James Joyce’s Ulysses . Ulysses tracks the fictional wanderings and thoughts of Leopold Bloom, the middle-class Irish “Ulysses” of the title, through the Dublin of June 16, 1904 in a series of episodes very loosely tied to the events of Homer’s epic (e.g., a section full of sound and music is referred to as the “Sirens” episode). I was initially attracted to Joyce for his notorious difficulty; he was supposed to be a challenge. But I stuck with Ulysses because the humor and humanity of the work outweighed its complexities. Bloomsday celebrations often involve marathon readings of some or all of Ulysses, and I’ve participated a few times as a reader here in Washington, DC. During my Dublin visit, the Bloomsday events were a mix of readers, Edwardian re-enactors, scholars, and tour guides for book locations. I also toured other areas of Ireland and visited the childhood home of Joyce’s wife, Nora Barnacle, in Galway. But Joyce wasn’t the only Irish author I pursued on this trip. I also visited the grave of the poet William Butler Yeats. For years, Yeats has been a centerpiece in my annual Irish Fest, a celebration of Irish culture. The power of dead authors in Ireland impressed me, so I came up with a rough science fiction story about their return, then put the draft aside while I worked on other projects. When I came back to my Irish authors story years later, I thought about changing it to a fantasy. I finally decided to keep it SF, because while I could have ghost characters do the same things as my AIs, I couldn’t find reasons as good for their behavior. 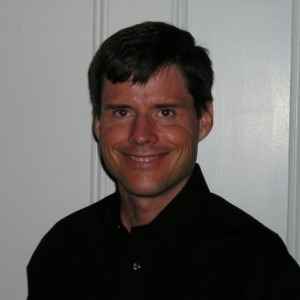 This story won a prize in the Writers of the Future Contest. If you’re a new writer, I very much recommend submitting to the contest and using its quarterly deadlines as motivation to finish new stories. In September 2011, I was on my way to Greece (in the footsteps of the original Ulysses), but I finished and submitted this award winner before getting on the flight just to have something in the running. Glad I did. The best review of this story probably came from Publishers Weekly, which called it a “riveting near-future exploration.” The worst review: “not particularly interesting.” Please let me know what you think of it. I’m grateful to Sean Melican, Doug Texter, Will McIntosh, and Shannon McRae for their sharp critiques, and to Angie Greene and Robert O’Donoghue for their Irish idiom review. And we are, in turn, very glad that Tom is allowing us to feature this wonderful story on The Scribbling Lion!